In the present study, parents learn to follow a totally auditory overt cumulative rehearsal training routine with their children with Down syndrome. Half the families are in the "Memory-first" condition and half are in the "Visual-first" condition. The Memory-first families begin with 3 months of memory training, then switch to 3 months of visual activities, and then return to 3 months of memory training. The Visual-first families have the opposite schedule. The visual activities serve as a control condition in which the amount of one-on-one time and attentional requirements are similar to the memory training. They include a variety of visually-based workbook activities, such as coloring, shape matching, and connect-the-dots. Before the first 3-month period and after each following 3-month period, parents bring their children to the lab for memory/language assessment. These assessments serve as pre- and posttests. Because the study is ongoing, we can only report preliminary data here. We can report early results from the first 3-month period, which has been completed by six Memory-first families and five Visual-first families. For the present report, we address two questions- (1) Can parents be good trainers? 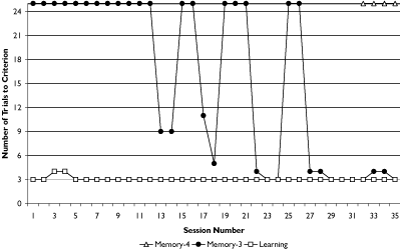 and (2) Can auditory working memory improve with parents as trainers?